The Sportsman’s plastics hold up well to mud and rocks on the trail. They help keep the rider as mud-free as they can. 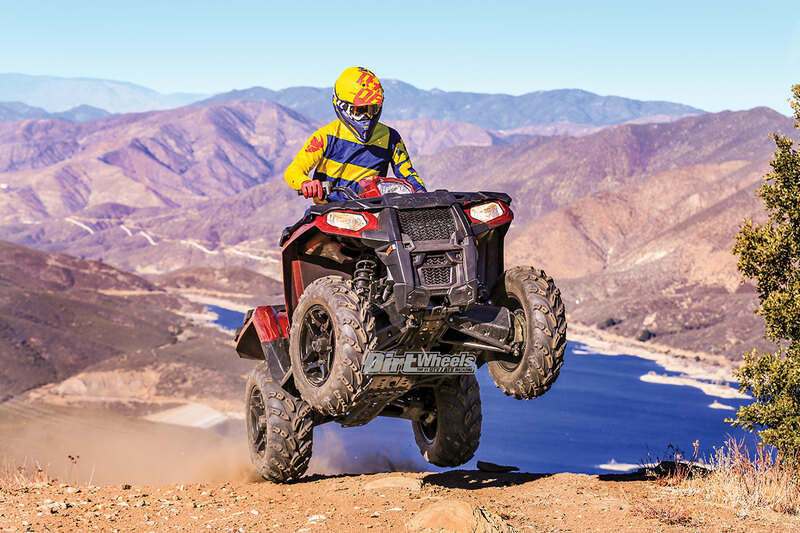 The better we get to know the Polaris Sportsman 570 SP, the more impressed we become with its performance and handling characteristics. 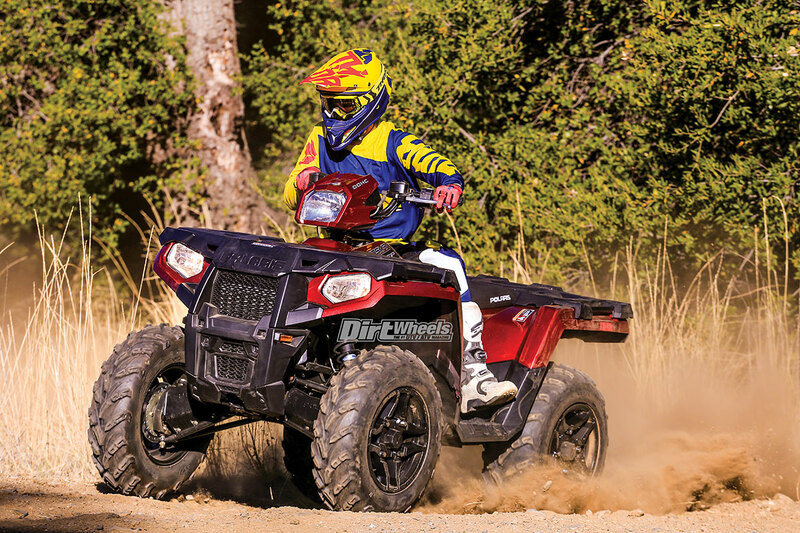 This mid-bore single-cylinder ATV has potent power delivery, generous suspension, and light and nimble handling, in addition to being quite useful as a workhorse. There weren’t many changes made to this machine for the 2018 model year, but it is nevertheless one of the most changed quads of 2018. The Sunset Red color scheme is brilliant, and so is its Radar Blue counterpart, and the changes made were quite useful. We have long felt that the engine braking system on the Sportsman was too strong, and that gave some riders a sense of unease when descending technical trails. This year Polaris adjusted the system to make it more pleasurable and relaxing on descents, yet still powerful enough to keep the speeds down on slopes. Another welcome change was the inclusion of stronger axles on each corner. We have never had axle problems, but we are always happy to have increased durability. The starting price of the 570 SP is a reasonable $8699. Polaris has many different versions of the Sportsman 570. The base model starts out at a price of $6699 with a modest feature list, but it carries the same healthy 44-horsepower mill that the whole lineup has nestled in its frame. Next, you can get the 570 with electronic power steering, which bumps the price up to $8199, but that also includes the engine braking system that we have finally come to truly enjoy. There are camo versions of this machine, along with an LE and Utility Edition, but the Polaris Sportsman 570 SP is the top dog of its breed. 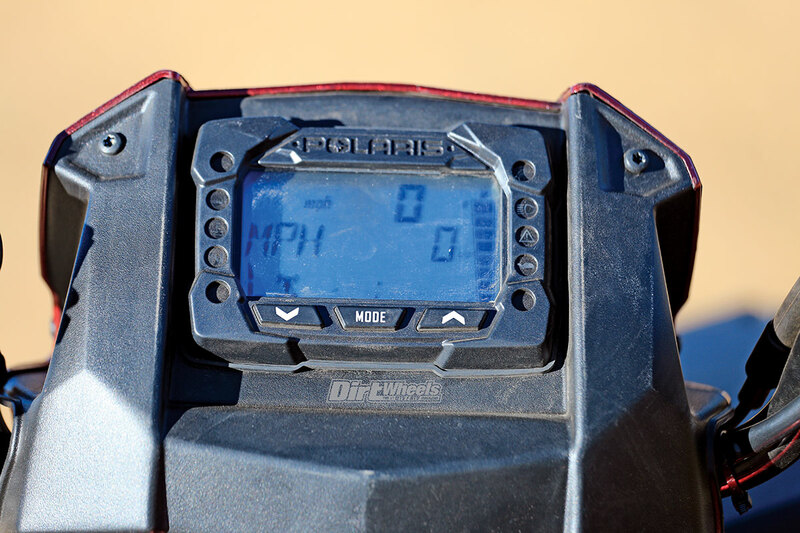 The SP comes with EPS, EBS and then you add on the active descent control (ADC) that further slows the ATV down on steep hills in four-wheel drive. On top of that, you gain a higher tow rating of 1500 pounds over the 1,225 of the base model, and the 14-inch aluminum wheels are a treat compared to the 12-inch steel ones. Needless to say, we chose to test the SP again for a reason—we had to see how much better the EBS and ADC are for 2018. The tachometer shows fuel level, gear selection, speed, hours, 4×4 indicator and much more. The Sportsman features a 567cc, ProStar, dual-overhead-cam, single-cylinder, four-stroke engine with electronic fuel injection and liquid cooling. Connected to the smooth and responsive engine is an automatic CV-style transmission that comes with high and low forward range, neutral, reverse, and park. These are easily selected via a stick-type shift handle on the right side of the 4.5-gallon-capacity gas tank. The Sportsman has what Polaris has coined “On-Demand all-wheel drive” that is driven through 50-percent-stronger axles to all four wheels. This means that when you change the selector switch on the right handlebar from two- to four-wheel drive, the computer will decide when it senses the rear wheels slipping and will then put power to the fronts to pull you through—or out of—whatever sticky situation you get in. We rarely ever feel like a full-time front-locking differential would be needed on this quad. 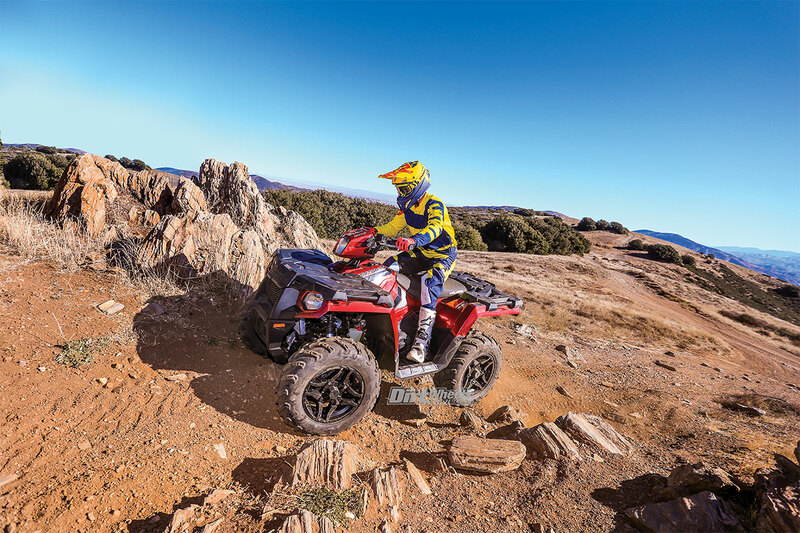 You can easily switch between two- and four-wheel drive, and the 570 SP also has a 4×4 active descent control setting. The last position on the 4×4 selector switch engages the ADC. This, in concert with the strong engine braking system, utilizes all four wheels to slow the Sportsman down with the compression from the engine. The system really works, and you can feel the front wheels engage and slow you down like the rears are doing from the EBS. The redefined EBS does exactly what Polaris states—it makes for smoother deceleration. On older models, the system would kick in and cause the rear wheels to practically lock up and slide in steep, low-traction situations. That gets really hairy when you are shredding down a steep hill. The machine doesn’t have a coasting feature like the base model that comes without the EBS, so it is engaged at all times. Fortunately, this model year isn’t nearly as intense in the EBS department. It provides a smoother and more trusting ride downhill. You can tow up to 1500 pounds with the 570 SP out of a 2-inch rear hitch receiver. 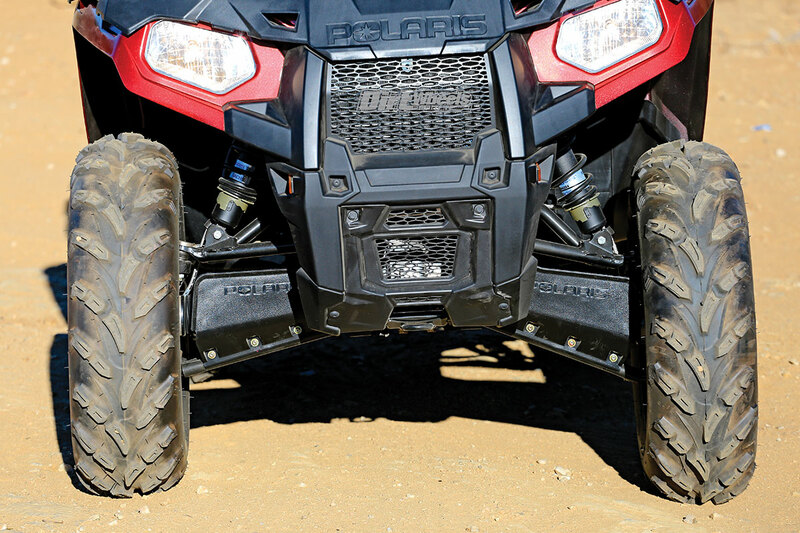 The suspension system on the Polaris Sportsman 570 is one of the best in its class. Out front, a dual-A-arm design allows the 570 to have 8.2 inches of wheel travel. Out back, the Sportsman’s IRS design has 9.5 inches of wheel travel. Those aren’t huge numbers, but the ride is plush and the shocks all have spring-preload adjustment. We have compared this machine to many other brands of 4×4 ATVs, and we generally lean towards the Polaris’ comfort and suspension geometry that provides a smoother and more controlled ride. There are 26-inch-tall CST six-ply tires wrapped around 14-inch aluminum wheels, which, in conjunction with the healthy suspension system, let the 570 have 11.5 inches of ground clearance. All of these factors contribute to the smooth ride in chop while also being able to soak up hard hits, tackle deep ruts, crawl over boulders and avoid getting hung up on trail debris. There are 26-inch-tall CST six-ply tires on the 570 SP that grip well in most all types of terrain. 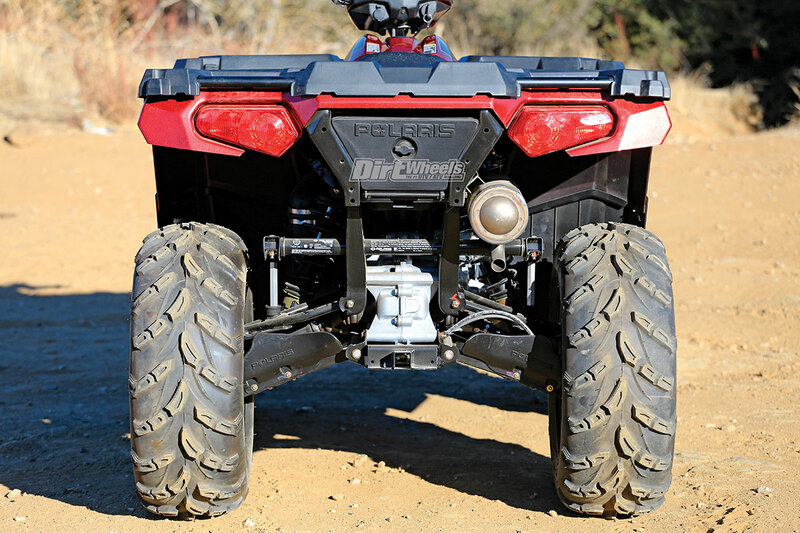 Polaris’ variable-assist electronic power steering system is smooth and precise. Some riders may feel like they don’t get enough steering feel, but if you ride a machine without EPS, you will quickly learn that it is a welcomed commodity when the trail gets rough. The usual jolting hits to the wheels don’t wrench the bar side to side, and the EPS works better when it senses that you are riding faster, slower or steering input has increased. The rider position of the Sportsman 570 is upright with a comfortable and spacious cockpit. The handlebar is swept rearward, which makes turning the machine more comfortable while in a sitting position. When you stand up, the sweep would feel a bit better if it was straighter, but most riders will enjoy the bar how it is. 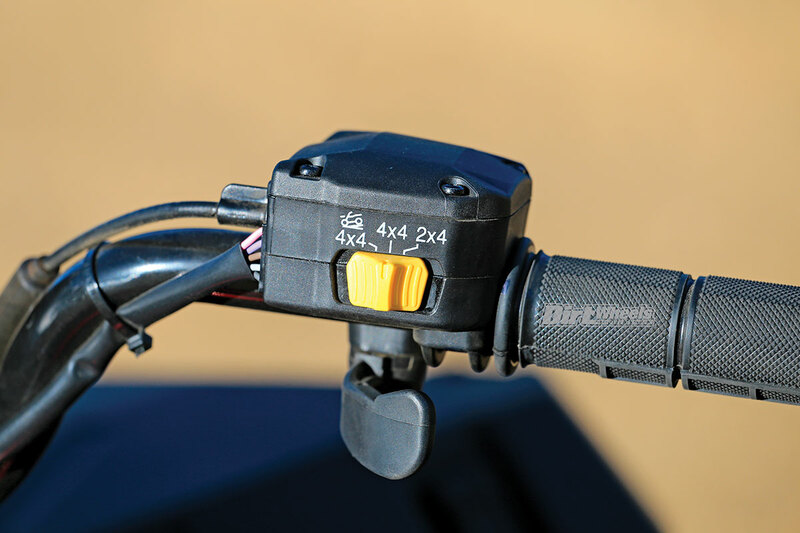 The throttle lever is wide and easy to modulate for hours of riding without a sore thumb. The only downside to the cockpit is that the machine is uncomfortably wide near the feet while being comfortably slim for your knees up at the gas tank. The axles were made 50-percent stronger on the front and rear of the 570. There is a winch-mount location already incorporated on the Polaris. Polaris utilizes dual hydraulic disc brakes front and rear to slow this rig down. Polaris is fond of utilizing a single handlebar-mounted lever that actuates the front and rear brakes at the same time. There is no lever that only controls the fronts; however, there is a foot-controlled brake pedal that engages the rear brakes. While the handlebar-mounted lever is comfortable for your fingers and easy to use, we have found that the foot-controlled brake lever sits up very tall off of the spacious floorboards. This means you have to lift your foot off the running boards to depress the rear brake lever. 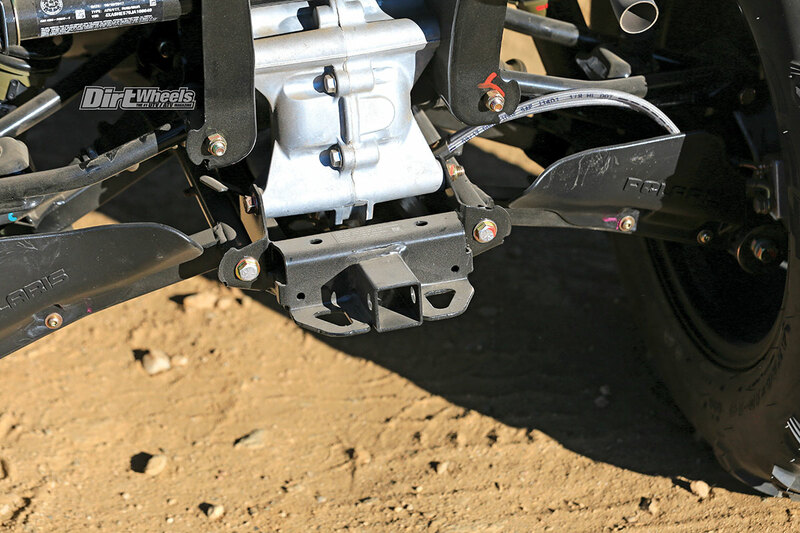 The brakes are strong and work very well, and we rarely ever feel the need or want to utilize the foot lever. The Sportsman 570 is a very fun machine to ride, but fun isn’t the only thing it does well. This quad has many worthy work-type features. One of our favorites are the two large cargo bins located at the front and rear of the machine. 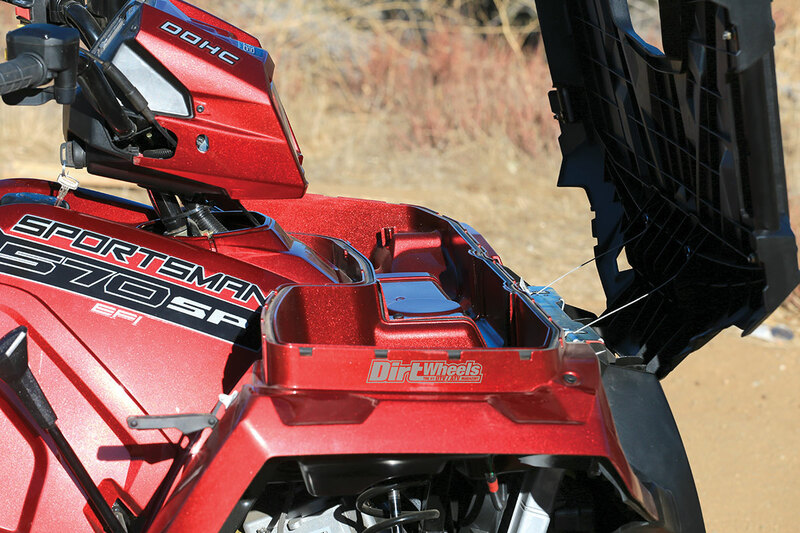 The front 6-gallon, water-resistant bin can be accessed by opening the plastic cargo rack lid. The rear storage container can hold 2 gallons and is located under the rear storage rack through a door at the back of the Sportsman. This bin sits right next to the exhaust system, so if you are trying to keep something cool, like water, we suggest using the front bin. The front and rear steel-framed Lock & Ride cargo racks are just as helpful by being able to support 90 and 180 pounds, respectively. This ATV hauls up to 1500 pounds with the standard 2-inch hitch receiver. That is a couple hundred pounds more than the base model of the 570 can pull. Polaris was smart, and they integrated a winch and plow mounting system that makes installing those parts much easier than other vehicles. The Sportsman has independent rear suspension and a 2-gallon-sized storage bin that sits below the rear cargo rack. We have put many miles on our 2017 Polaris Sportsman 570 SP, and we have just begun putting many miles on this 2018 model. The difference in the EBS is much better this year, with a smoother operation that isn’t as strong in a good way. The ADC works wonders when descending steep hills at slow speeds, and the EPS is smooth and helpful in the steering department. The power of the 44-horsepower engine is effective for its size. 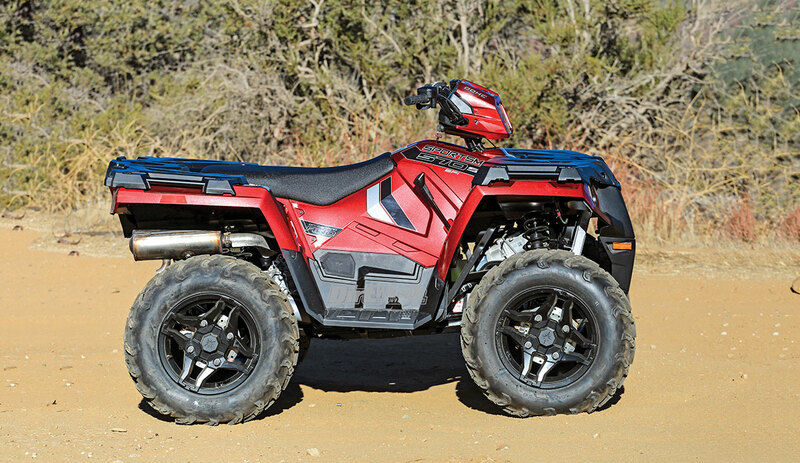 The unusual engine size, and Polaris’ jump from a 570 single to an 850 twin in the 4×4 quad line-up means that this model is typically compared to 750cc-class 4×4 quads. Compared to those big-bore machines, the torque feel is a little soft off the bottom in high range, but the mid-to-top-end power is potent. The On-Demand all-wheel-drive system works well in all types of terrain, and it is rare that we would ever utilize the rear-wheel drive only. As we stated before, it is rare that we would need a fully locking front differential, but we wouldn’t ever be against the option. The front storage bin is capable of holding up to 6 gallons with a water-resistant seal on the cargo lid. The brakes are smooth yet strong when you need them to be, and the cockpit of the 570 is roomy for any rider with plastics and fenders that do a great job at keeping mud and debris off the rider. The cargo space is abundant, and the towing capacity exceeds what we would generally use the Polaris for. We are fond of how well this machine handles all types of terrain—from the woods to the desert and even to the sand dunes. If you are interested in checking out Polaris’ 2018 lineup of ATVs and UTVs, go to www.polaris.com or go to your local Polaris dealer. You can purchase the 570 SP model in Sunset Red or Radar Blue, and Polaris utilizes automotive paint on the plastics.